Genetically, culturally and ethically the Khoe-San have something special to add to this world. The importance of this study is to put the Khoe and San heritage in the right place in history and this research will provide a genetic backdrop for future studies - Mattias Jakobsson. The largest genomic study ever conducted among Khoe and San groups reveals that these groups from southern Africa are descendants of the earliest diversification event in the history of all humans - some 100 000 years ago, well before the 'out-of-Africa' migration of modern humans. Some 220 individuals from different regions in southern Africa participated in the research that led to the analysis of around 2.3 million DNA variants per individual – the biggest ever. The research was conducted by a group of international scientists, including Professor Himla Soodyall from the Human Genomic Diversity and Disease Research Unit in the Health Faculty at the University of the Witwatersrand in Johannesburg. Entitled Genomic variation in seven Khoe-San groups reveals adaptation and complex African history, the study has been selected for early online publishing in the renowned scientific journal, Science, on Thursday, 20 September 2012 at 20:00 SATS (14:00 U.S. EST). "The deepest divergence of all living people occurred some 100 000 years ago, well before modern humans migrated out of Africa and about twice as old as the divergences of central African Pygmies and East African hunter-gatherers and from other African groups," says lead author Dr Carina Schlebusch, a Wits University PhD-graduate now conducting post-doctoral research at Uppsala University in Sweden. Soodyall, from National Health Laboratory Services in South Africa, has a long standing relationship with Khoe and San communities and said that the findings are a "phenomenal tribute to the indigenous Khoe and San people of southern Africa, and through this magnificent collaboration, we have given the peoples of Africa an opportunity to reclaim their place in the history of the world". 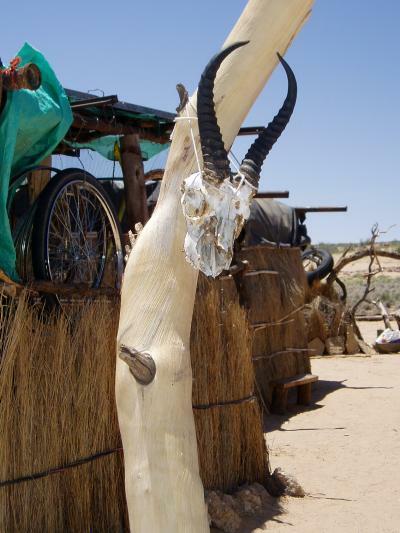 Besides the publication of the study, the authors will also be visiting the San groups in the Kalahari, in the Askam area in South Africa on the 24th of September 2012 for the country's Heritage Day celebrations. "We are excited that together with some of our colleagues from Uppsala University, we will be able to join in the celebrations with the San groups in the Kalahari who participated in our research and to acknowledge their contribution in making our research possible". The researchers are now making the genome-wide data freely available: "Genetic information is getting more and more important for medical purposes. In addition to illuminating their history, we hope that this study is a step towards Khoe and San groups also being a part of that revolution," says Schlebusch. Another author, Professor Mike de Jongh from University of South Africa adds, "It is important for us to communicate with the participants prior to the genetic studies, to inform individuals about the nature of our research, and to also go back to not only to share the results with them, but also to explain the significance of the data for recapturing their heritage, to them." According to Assistant-Professor Mattias Jakobsson from Uppsala University, these deep divergences among African populations have important implications and consequences when the history of all humankind is deciphered. The deep structure and patterns of genetic variation suggest a complex population history of the peoples of Africa. "The human population has been structured for a long time," says Jakobsson, "and it is possible that modern humans emerged from a non-homogeneous group." The study also found surprising stratification among Khoe-San groups. For example, the researchers estimate that the San populations from northern Namibia and Angola separated from the Khoe and San populations living in South Africa as early as 25,000 – 40,000 years ago. "There is astonishing ethnic diversity among the Khoe-San group, and we were able to see many aspects of the colorful history that gave rise to this diversity in their DNA", said Schlebusch. The study further indicates how pastoralism first spread to southern Africa in combination with the Khoe culture. From archaeological and ethnographic studies it has been suggested that pastoralism was introduced to the Khoe in southern Africa before the arrival of Bantu-speaking farmers, but it has been unclear if this event had any genetic impact. The Nama, a pastoralist Khoe group from Namibia showed great similarity to 'southern' San groups. "However, we found a small but very distinct genetic component that is shared with East Africans in this group, which may be the result of shared ancestry associated with pastoral communities from East Africa," says Schlebusch. With the genetic data the researchers could see that the Khoe pastoralists originate from a Southern San group that adopted pastoralism with genetic contributions from an East African group – a group that would have been the first to bring pastoralist practices to southern Africa. The study also revealed evidence of local adaptation in different Khoe and San groups. For example, the researchers found that there was evidence for selection in genes involved in muscle function, immune response, and UV-light protection in local Khoe and San groups. These could be traits linked with adaptations to the challenging environments in which the ancestors of present-day San and Khoe were exposed to that have been retained in the gene pool of local groups. The researchers also looked for signals across the genome of ancient adaptations that happened before the historical separation of the Khoe-San lineage from other humans. "Although all humans today carry similar variants in these genes, the early divergence between Khoe-San and other human groups allowed us to zoom-in on genes that have been fast-evolving in the ancestors of all of us living on the planet today," said Pontus Skoglund from Uppsala University. Among the strongest candidates were genes involved in skeletal development that may have been crucial in determining the characteristics of anatomically modern humans. Issued by: Erna van Wyk, Communications Officer, University of the Witwatersrand, Johannesburg.